Upgrading or building a golf course also requires development. Using certain approaches will assist with a balance between environment and science while beautifying the landscape you are creating. These top five golf course landscaping ideas can guide you to a first class look for your new upgrades. 1. Combining Greenery with Pathways. Golf courses look best when there is a balance with the turf, pathways and landscape plants. Combining different forms of greenery along the path will assist with a pleasant experience for those interested in playing. 2. Define Sections of the Landscape. If you want to make the most with golf course landscaping ideas then, you can look at different sections of the golf course. Pool areas, waterfalls, natural backdrops and other unique additions are able to offer more for the players while playing a round of golf. 3. Looking at Other Real Estate. 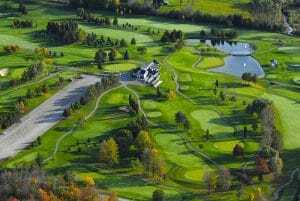 If you are just beginning your journey to a golf course, then you will want to look at a blueprint that adds in more than just a section to play golf. Real estate sections, marinas and private parks are some of the unique additions you can add in with golf course landscaping ideas. 4. Water, Turfs and Pathways. Combining water with the turf is able to provide a unique flavor to your golf course. It creates a challenge to those who are interested in golfing. It also creates a unique twist with the look and feel of the development of the course. There are different formulas for water that can be used with golf course landscaping ideas. 5. Shape the Pathways and Turf. Adding in unique shapes and looks with the turf and landscape will alter the final design of your golf course. You can create unique shapes with the turf as well as the format of the pathway, adding in unique twists with the golf course landscaping ideas. If you are looking for an upgrade or new design, then you will want to consider the fundamental approaches for golf course landscaping ideas. There are a variety of looks that you can add in, all which will guide you towards the right look for the next game. By approaching your golf course with unique designs, you will easily be able to create the perfect look for those that are interested in joining the next game.